This story ought to be at the end of my Africa tales since we were residing in Egypt at the time but there’s no need to start at the beginning. It’s very short. It’s raining here which means that there’s precious little Internet connectivity so there may not be enough time in a session to upload anything longer. We’d been living in Egypt for almost a year when father got word that he was supposed to meet with another US diplomat on a ship that was scheduled to traverse the Suez Canal. The afternoon prior to the meeting we drove from Cairo to Port Said to await the ship’s arrival. The next day we could make out the ship from the balcony of the hotel where we spent the night. As the harbor master flagged them in, the awaiting ships moved up to form the next convoy. Once settled in, it was possible for those ashore and those aboard to transfer via a harbor lighter. We took the lighter to reach the ship. It was an English vessel although I cannot remember its name. Given the large number of Union Castle vessels then serving the east coast of Africa, I’d venture to guess that it was of that line. Once aboard we were ushered to vast sitting room within which was a lavishly stocked bar. The individual that father was to meet with appeared soon thereafter. While there we ordered drinks and possible a bite to eat. Something impressed father about the ginger ale they served and he asked if he might purchase a case. “Certainly sir!” came the response. As we left the vessel, under father’s arm was tucked a case containing 24 small cans of Schweppes ginger ale. Upon return to Cairo some of the cans were placed in the refrigerator to cool. Then, after waiting an appropriate period, we had some. We have ginger ale in the US but not like this. 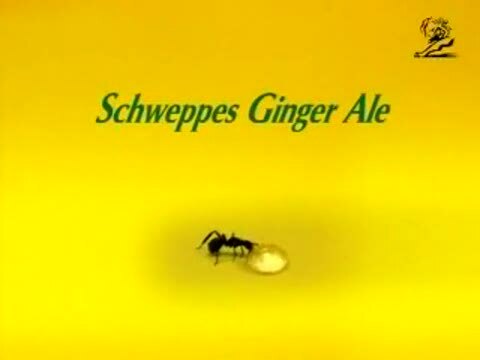 In fact the US version of Schweppes isn’t the same as the English variety. It wasn’t uncommon for kids to drink ginger ale in the US, but I suspect that kids in the UK didn’t consume the version produced there. First off, it really had a punch! There was no doubting that you were drinking something that had some serious ginger in it. And one other thing: there was far less sugar. In short the US version was and continues to be light on the ginger and heavy on the sugar. « I almost forgot! It rains in Africa. George, I am thoroughly enjoying your vignettes. ..surely there will be more after Africa. Thank you for sharing.